if you haven't heard about southbound food, then you definitely haven't been following me on twitter. and you probably weren't at the listening party this evening at anvil bar & refuge. southbound food is the new local food radio talk show hosted by bryan caswell of REEF and little bigs and sports talk show host, lance zierlein on 1560 AM the game. bryan caswell, recently awarded the 2009 best new chef award by food and wine magazine and given his own official houston holiday ( july 21st now goes down in h-town history as bryan caswell day), can seem to do no wrong these days. the show has started with great personalities and momentum and is truly entertaining, albeit a tad racy, and definitely hilarious. the first test show aired last weekend with special guests, jonathan jones from beavers and mark musatto from airline seafood. this week jonathan jones returned with bobby heugel from anvil and me. ME! show two first aired last night, again twice today, and tomorrow at 9AM and 6PM. tune into 1560 AM or stream it live from their website. if you haven't been able to catch it and can't wait until tomorrow to tune in, i have the podcast links for you here. there are three segments and i promise the show gets funnier and funnier with each click. after you listen in, please let the producers know how you feel. leave a comment here or send an email or tweet to lance zierlein. the show will eventually find a permanent time slot on saturday. i'll keep you updated on that! the show is now accepting advertisers too (contact lance for more info). and i'm happy to announce that i've already been invited back to do another show! Some of you have been anxiously awaiting these Pork Belly Throwdown announcements. don't forget: tickets to the throwdown go on sale tomorrow. details will be posted to the houston chowhound yahoo! board. complete event details on the official website. not really like me to brag about a dinner until after i've actually eaten it. this blog post comes sans tasty photos, only an insane menu! randy rucker, executive chef at the rainbow lodge has planned an extraordinary dinner for the houston chowhounds next week. LIVE sea urchins (yes, with long black spines still moving and everything) are the guests of honor and will be flown in from santa barbara. 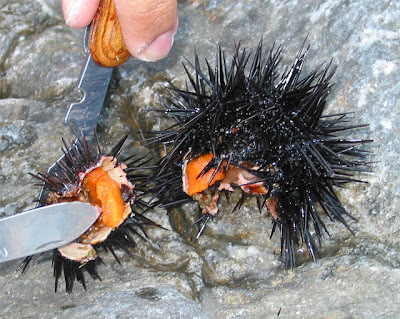 each human attendee gets his/her own sea urchin and randy will give us a lesson on how to open and clean it. afterwards, we'll cure the lovely, sweet roe and enjoy this all-uni, all-star menu! this menu is totally *sick* right? 20 attendees max & there are still spots left. RSVP here. if you thought the fried chicken throwdown was over-the-top, this one will definitely make your jaw drop. 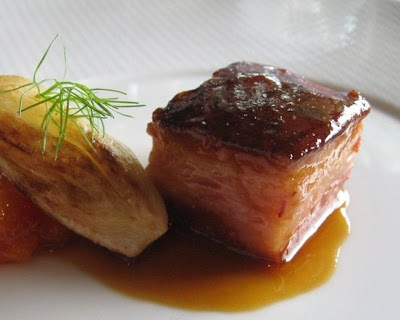 yes, it's a pork belly throwdown and a prescription for lipitor should probably come with each judge's ballot. in this round, the throwdown will be more iron chef than throwdown with bobby flay. this time, we have a (not-so) secret ingredient and the chefs will choose to prepare the ingredient anyway they choose as long as it's the main ingredient in the dish. judging criteria will be based on originality, plating, and taste. and how fun would pork be without beans? (or really, the other way around.) houston chowhounds amateur chefs will competing in a battle beans potluck that the real chefs will be judging. houchies can register to compete on the chowhound discussion board. the event will be hosted by chris shepherd at catalan on mon, aug 17th. tickets will be $25 each and will go on sale on mon, july 20th after competing chefs and judges are announced. ticket proceeds remaining after covering food costs will benefit the charles v. blanton community garden in the 1st ward. jonathan jones, the host of our last throwdown; the FCTD throwdown champions, randy evans and cody vasek; and antoine ware, catalan's sous chef, will be guaranteed entry in this throwdown. the remaining spots will be determined by lottery. the registration deadline for chefs to enter the lottery is july 17th @ 5pm. a wild card judge will also be chosen for the judging panel. if you would like to be considered, please submit a short essay on "why you should be a PBTD judge" to imneverfull@gmail.com by july 17th @ 5pm. event details, registration information, and judging criteria have been posted here. check the bottom of that webpage, join the houston chowhound discussion board, or follow @imneverfull on twitter for PBTD news and announcements. summers in houston mean unbearable heat to most people, but for houston chowhounds it also signals that the annual BBQ smackdown is near. usually scheduled the saturday before july 4th, pearl bar was chosen again as the venue because the 1st annual bbq smackdown was so successful there. however, this year had an attendance of 60 hungry houchies (twice as many attendees as last year) as the group has grown to over 400 members in just 1 year. the premise was simple. brisket and ribs were brought in from 6 local bbq joints and were blind judged by the attendees. our top three winners (pierson & co, burns, and luling city market) from last year's competition were up against three new competitors. this year our farthest competitor was vincek's in east bernard who was picked because they were listed in texas monthly's top 50 bbq joints last year. several chowhounds were shocked that burns didn't place again this year. others were shocked that thelma's placed dead last in each category. it should be mentioned that thelma was sick that day but since we had pre-ordered and prepaid for the food, our order was ready for us that morning, however her restaurant was closed. here are 2 wonderful write-ups of the event. one by the houston press and the other by great food houston.